Last time in the main story, you managed to make your daring escape form the city of Nieboheim with the aid of the dashing Chaosweaver, Khvorost. This week, it's time to head home to the Land of Dragons. Back to Falconreach, back to Sulen'Eska, back to the Rose... and who knows what else? But first there's the tiny matter of you falling from a great height outside of Nieboheim. How will you survive this predicament? Head over to Nieboheim to play the next chapter of the Book 3 main story: Coming Home! This year, the Grenwog has stolen a clutch of extremely rare and valuable eggs and tossed them all into the Pale Sea! Why would the Grenwog do such a thing? Well, the Grenwog is nowhere to be found, but those eggs need rescuing! Until the end of April, every quest in the Pale Sea has a chance to drop Ostara's Eggs! 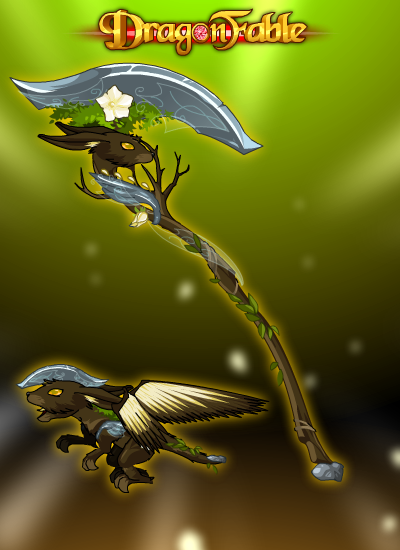 You can use Ostara's Eggs to exchange for amazing rewards created by Dracelix including the beautiful Ostara's Cull scythe! If you're lucky, you may even find Ostara's Golden Egg! You can exchange Ostara's Golden Egg and some Ostara's Eggs to obtain the Ostara's Dracobunny pet! Ostara's Dracobunny has a chance to apply a DoT, and its damage scales with your level! What are you waiting for? Go save those eggs before they're lost forever! Guests now increase enemy damage by 60% per guest, up from 50% per guest. Guests were slightly too powerful after the recent changes. After going through many, many options, (target player only, set target order, pseudo random targetting, pseudo random comboing, etc) it was decided that keeping the random targetting is currently the best choice. However, to compensate for the incredible amount of survivability and power that brigning guests gives you (especially with the removal of random turn order), the damage of enemies when using guests has increased. Given time, this may increase even further, or other options may be implemented. Critical hits are now turned into normal hits when blocked by B/P/D defenses. These normal hits are affected by STR's secondary bonus, and not INT's. B/P/D lost a little bit of power with the changes to DEX. This makes B/P/D stronger, while also lowering the effectiveness of INT, which is currently slightly more powerful than STR in higher levels. Pre-9.0 (non-scaling enemies) are now affected by guests. This means they gain damage and have their exp and gold modified by guests as well. They also now follow the same rules as post 9.0 enemies- they have random targetting against guests and the player now instead of only attacking the player, for example. Fixed issues where equipping a pet on your turn would skip the pet's turn, or equipping a pet on a guest's turn would skip the guest's turn or lock the game. Fixed a bug that prevented players from purchasing more than 15 Bank slots. What's next for the Hero? What is going on in the Sandsea? Have theories about the story? Feedback about recent releases? Want to discuss all things DragonFable? Join the discussion on the official forums! Want to play DragonFable without using an internet browser? Check out the Artix Games Launcher! With this weekend's flurry of updates, it's totally understandable that there may be some confusion about how stats work, and what they do. So today, I have a detailed description of what every stat does, and other game concepts! Increases Melee direct damage done by STR/10, rounded down. Increases damage done by non-critical hits by (STR/10)%. At 200 STR, you will have +20 Melee damage and 20% additional damage on non-critical hits. Increases Pierce direct damage done by DEX/10, rounded down. Increases damage done to enemies affected by DoT effects (including heal over time effects) by 3(DEX/80)%. At 200 DEX, you will have +20 Pierce damage and 7.5% additional damage to all attacks. Increases Magic direct damage done by INT/10, rounded down. Increases damage done by critical hits by (INT/10)%. At 200 INT, you will have +20 Magic damage, and 20% additional damage on critical hits. Increases Pet and Guest damage by CHA/10, rounded down. Increases the amount of Gold and Exp gained when using Guests by (CHA/10)%. Increases the activation rate and power of various Pet abilities. At 200 CHA, Pets and Guests will do +20 damage per hit, and +20% Exp/Gold earned per Guest. Increases Critical Hit rate by LUK/10, rounded down. Increases Melee/Pierce/Magic Avoidance by LUK/20 rounded down. Affects other small things such as Direct Hit rate, and pet dragon skill activation rates. At 200 LUK, you will have an addtional 20 Crit and 10 M/P/M. Increases maximum HP by END * 5. Increases Immobility resistance by END/5, rounded down. At 200 END, you will have an additional 1000 HP, and 40 Immobility resistance. Increases maximum MP by WIS * 5. Decreases Health resistance by WIS/20, rounded down. Increases Bonus to Hit by WIS/10, rounded down. At 200 WIS, you will have an additional 1000 MP, -10 Health resistance, and 20 Bonus. Increases your chance to completely avoid damage and effects from attacks. Increases your chance to convert normal hits into Glancing Blows, which do 10% normal attack damage. Critical Hits bypass this defense. Decreases the amount of damage taken by the specified Element or status effect. Resistances on the player can only reach a maximum of 80 to a specific Element from gear. Resistances on the player can only reach a maximum of 99 total. Health resistance reduces the amount of HP that is recovered from healing. Negative Health resistance increases the amount of HP recieved from healing. Immobility resistance doesn't protect against damage, rather it protects against Immobility effects. When an Immobility effect is applied, you have an (Immobility resist)% chance to resist it. All resist is just that- resistance to all! This stacks with all other resistances, including Health and Immobility resistance (meaning, it does reduce the amount you heal), and can push them over the 80 from gear maximum. This is the amount of base damage your attacks will do. Many attacks may modify this damage, either increasing or decreasing, dividing it between multiple hits! In the Character Info screen, Dmg shown does not include the additional direct damage from STR/DEX/INT. This is the Element of your current weapon. Certain skills may change that element, and some weapons can change element too! This is your Critical Hit rate. Critical Hits are calculated out of 200. This means if you have 100 Crit, you will have a 100/200 (50%) chance to make a Critical Hit! Critical Hit rate is capped from gear at a maximum of 100. This can be exceeded by training LUK or using certain skills or consumables. This is your base chance to hit. Your Bonus is compared to your enemy's corresponding M/P/M avoidance and B/P/D defense in order to calculate if you hit or not. First, a number is rolled between 0 and 150 (inclusive). Then, that number is added to your Bonus. If the result is higher than your enemy's M/P/M, then you hit! But you're not safe yet- another number is rolled between 0 and 150 (inclusive), and added to your base Bonus. If that number is less than your enemy's B/P/D, then you'll have a Glancing Blow unless you get lucky with a Critical Hit! For example, let's say you have 50 Bonus, and the enemy has 100 M/P/M and 100 B/P/D. First, a number between 0 and 150 is rolled. 67! Now, we take that and add that to your base bonus of 50 to get 117. Since 117 is greater than the 100 M/P/M of your enemy, you hit! But wait, we have to check against B/P/D too! A second number between 0 and 150 is rolled. Uh oh, we got 1 this time. 50 + 1 is 51, which is lower than your enemy's 100 B/P/D. So the end result is a Glancing Blow... unless you get lucky with a Critical Hit. If, when checking against M/P/M, the random number rolled is 0, you get a Critical Miss. This means your attack automatically misses, even if your Bonus is naturalyl higher than your enemy's M/P/M. If the roll against M/P/M PLUS the Direct Hit bonus from LUK (LUK/25, rounded down) is 150 or higher, then you get a Direct Hit! Direct Hits always hit, and don't check against B/P/D. A Glancing Blow results in reduction of 90% of the damage done, and prevents any on hit effects from taking effect. Boost is a percent increase in damage. For example, if you have 50 Boost, your attacks will do 50% more damage. Guests are allies that you can invite along with you on your quests! Guests may make fights easier because of their HP and damage, but there are some downsides. Until you have 100 CHA, Guests will reduce the amount of Gold and Exp you earn in battle. Above 100 CHA, however, Guests will increase the amount of Gold and Exp you earn in battle! For each guest you bring, enemies will gain 60% more damage. If a guest falls in battle, they will be removed from your party, and will have to be readded after your quest. Immobility effects come in many shapes and forms. When an enemy or guest is Immobilized, they will not be able to act for the duration of the effect. When the player (that's you!) are Immobilized, you will have a 33% chance to be unable to act for each turn of the duration of the effect. For example, if you've been Immobilized for 3 turns, every turn, you have a 66% chance to be able to use your skills. Whenever you equip a pet while in battle (including unequipping and re-equipping the same pet), it will be Immobilized for its next turn. You can freely swap pets outside of battle, however. And that's all for today! If you have any more questions about stats or game mechanics, you can check out the DragonFable forums or contact us on Twitter! Thank you for playing, and we hope you'll enjoy the releases to come! I know, I know, it's been a volatile weekend for stats. This should be the last update though (bar any extreme unforseen issues). I will follow up later with a summary of all stats. STR now increases damage of non-critical hits by (STR/10)%. DEX now increases all direct damage to enemies affected by DoT effects (except for Vaal's Ego) by 3(DEX/80)%. STR and DEX were still too niche with the buffs to their secondary damage effects. These changes bring them in line with the damage bonus from INT, while still giving them their own (admittedly small) identity. I can understand that you may see DEX's 7.5% and think, wait, that seems low! Well, here's the math breakdown. STR/LUK results in an average of 150 damage. 55% chance for 1.75x damage, 45% chance for 1.2x damage. INT/LUK results in an average of 152 damage. 55% chance for 1.95x damage, 45% chance for 1x damage. DEX/LUK results in an average of 152 damage. 50% chance for 120, 50% chance for 195. 50% chance of 108, 50% chance of 210. 50% chance of 129, 50% chance of 188. As you can see, DEX is on par with INT and STR for damage, even if its boost number seems low. Its damage may seem slightly higher, but also keep in mind that it requires a DoT to first be applied to an enemy in order to take effect. LUK's damage might seem low, but it does provide other benefits beside Crit, and is non-conditional. Enemy damage now scales less with guests. (Enemies now gain 25% 50% more damage per guest, down from 75%. Pet dragons (kid, toddler, and baby) can now be summoned in battle. Equipping a pet while in battle will stun it for a turn with "Waking Up". These changes are to make CHA a more attractive option, while also managing pet swapping. Lowering the risk of taking guests makes them stronger, and pet dragons are one of the main beneficiaries of CHA. However, pets are very strong, and being able to constantly swap them out for free is a little too powerful, especially with the pet dragon. As a result, the Waking Up stun has been added, which prevents pets from attacking on the turn that they are equipped. I am aware that stat training costs are currently a bit high. This is something that I would like to address in the future, but unfortunately cannot be done at the moment. For this, I apologize. I would like to thank everyone who has provided feedback and criticism- I know even with these changes, some players may still be dissatisfied. However, we will see what the future brings! Have feedback about the proposed combat changes? Having trouble with any fights? 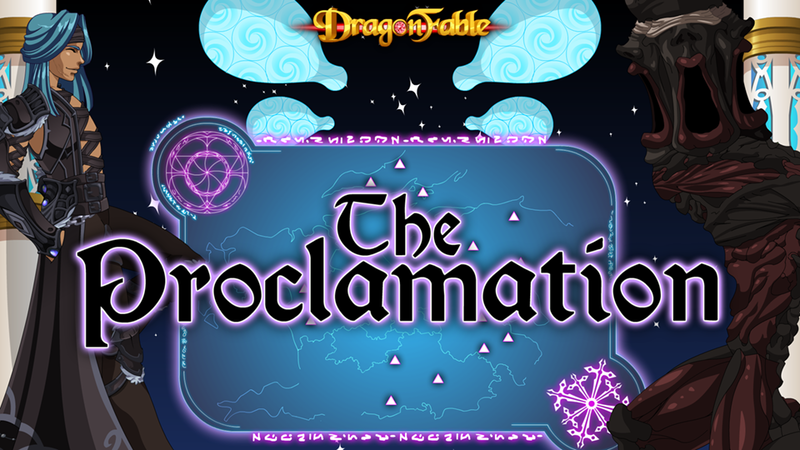 Want to discuss all things DragonFable? After listening to player feedback, and discussing the recent changes at length, I've decided to give it another go. The previous implementation, while it achieved its goals, was unintuitive and frustrating in some aspects. THESE CHANGES ARE NOW LIVE! STR, DEX, and INT will lose their tertiary effects. STR's bonus damage on non-crits has been increased to STR/20, up from STR/25. DEX's bonus damage on DoTs has been increased to DEX/8, up from DEX/10. END will now provide Immobility resistance. WIS will now provide Bonus to Hit. LUK will now provide M/P/M avoidance of LUK/20, up from LUK/25. Immobility effects on the player only (NOT enemies or guests) now have a 66% chance to not immobilize the player on their turn. For example, if you are stunned, on your turn, you have a 33% chance to lose your turn, and a 66% chance to be able to act. This does NOT purge the stun. 1: STR and Immobility Resistance. Having an extremely strong defensive ability on a main stat made it too necessary, and limited build options. Decreasing STR synergy, while it accomplishes the fact that it is no longer as optimal, also made it unsatisfying to train, and did not feel good to use when you wanted or needed Immobility resistance. The Immobility bypass effect of DEX had the intended effect of making STR less useful- however, you still needed the Immobility resist if you wanted to resist stuns. It also wasn't clear at first glance how much Immobility bypass you needed. This was a mistake on my part, and I m thus removing it. This is also the impetus behind the WIS change from a hidden bonus to direct -Health resistance. The changes to STR and DEX secondary boosts should bring them to be relatively in line with INT. At 250 INT, your critical hit will do 25% more damage, or 25 more damage on a base 100 crit attack. At 250 DEX, each DoT will do 31 more damage per turn. This is somewhat situational, but compared to INT, unless you are hitting multiple boosted crits, even a single DoT provides similar damage. The base is higher though, since this does not synergize with Boost. And multiple DoTs make DEX stand out even more. At 250 STR, your non critical hits will do 12 more damage. At first this seems like not a lot. However, you only need 3 non-crit hits in one turn to bypass the bonus from INT on a basic critical attack. And you almost match with 2. STR is therefore situationally weaker than INT, however it should be more reliable. You can, of course, combine the offensive stats and be hyperoffensive! END is now even more defensive. However, the Immobility effect has been changed in order to make offensive builds more viable. Otherwise, full END would become the next problem. END was already strong, and this makes it stronger. But not necessary. These changes and compromises should provide a better, clearer, and more fun combat experience! This week, the Six Heroes story continues! After taking on the plucky Falwynn as your apprentice, you encountered Faust, the mysterious fighter from the Tournament of Champions, and became curious about his origins and power. 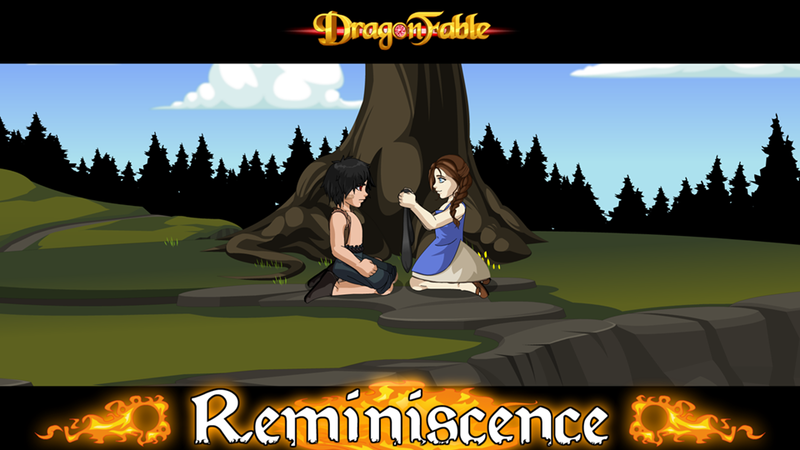 This week, head over to Ash in Book 3 Falconreach to continue the Six Heroes story with this week's quest: Reminiscence! This week also sees some bug fixes, engine updates, and combat changes, specifically regarding Glancing Blows, Immobility Effects, STR, and DEX. Fixed a bug where completing the quest Forest Hunt from Symone's Castle would lead to a black screen. Fixed a bug where a critical hit bypassing B/P/D defenses would not apply on hit specials. Adjusted initial character loading sequence to reduce (and hopefully eliminate) loading stalls. Ruby the Adventure Chef in Book 3 Falconreach now sells upgraded Zard Cuisine options. Zard Cuisine+ applies Stuffed for 10 turns, down from 30. Ruby the Adventure Chef in Book 3 Falconreach now sells Moglinberry Candy. Moglinberry Candy increases Immobility resistance by 50 for 2 turns, and Stuffed for 10 turns. Guests no longer affect enemy HP. However, they still increase enemy damage. Glancing Blow damage has been reduced to 10% of normal damage, down from 25%. DEX no longer affects Glancing Blow damage. DEX now allows your skills to bypass DEX/5 Immobility resistance. Enemies with DEX can also bypass your Immobility resistance using the same formula. Immobility effects will now notify you when they are applied, rather than when they are resisted. This is to make it more clear when you are immobilized by an attack that hits multiple times. This does make it harder to tell if an enemy is trying to immobilize you with a specific skill if you have enough resistance, and this may still be reworked in the future. STR no longer applies a multiplier to all stat damage. STR now increases damage done by non-critical attacks by STR/25 damage. For comparison, previously at 250 STR, attacks would gain approximately 12.5 damage per hit from the STR multiplier. This damage would also be multiplied when considering critical hits. Now, at 250 STR, attacks that do not critically hit will gain 10 damage per hit from the STR bonus. Critical hits will not have this damage added in. The goal of these combat changes is to a) make immobility effects easier to deal with, and b) balance out the "main" stats of STR, DEX, and INT, as previously, STR was too general and restricted build choices. There was no goal to make the game or challenge fights any more difficult or any easier. Simply more generally fun. The reduction in effectiveness of Immobility on the player make Immobility effects less of a death sentence when applied. This, combined with the new addition of Moglinberry Candy (+50 Immobility resistance for 2 turns), means that it should not be as necessary to train STR as before in order to survive agaisnt enemies that can immobilize. STR, DEX, and INT now each have "balanced" effects. Before, STR's bonus damage to all stat types meant it was always more powerful offensively than the other stats. As the game continues to grow and challenges evolve, some of these effects may become unbalanced or more favorable than others. For instance, if enemies start tending toward having higher base defenses, then INT's Bonus to Hit starts becoming less situational and more general. Another concern that players may have is that it seems like STR's situational bonus damage punishes players for having high crit. However, I would argue that outside of intentionally boosting critical chance (which on its own will do more damage than the bonus damage gained), you still won't have an extremely large number of crits compared to non-crits. This bonus damage is also applied per hit, which can be extremely powerful on multi-hit attacks. It's not punishing you for not getting crits, but rather slightly normalizing the damage between crits and non-crits. As always, I read and appreciate all of your feedback. What could be coming next for Falwynn, Faust, Sophie, and you? Looking forward to the next quest in the Six Heroes story? Have feedback about the new combat changes? Want to talk about all things DragonFable? Monday Update, Fixes, and Proposed Changes! A few small updates for Monday! Timeshift's tooltip said it used up to 4 momentum. This was a typo. Timeshift's tooltip now properly references the 6 momentum max. Fixed an issue where the Gears of Time skill did not need to hit to properly apply its effect. Fixed an issue where Legion Crawler could cause the game to lock up if it defeats a character. Fixed an issue in The Exaltia Tower where the "Remove Consumable" effect was not functioning properly. Also, something that I'd like player feedback on! The combat stat update was a resounding success. However, there are some lingering issues. Stuns are very powerful, and as a result, Immobility resistance is very powerful. The STR stat, as a result, is a bit over powered compared to INT and DEX. INT is fairly strong due do its offensive capabilities, but DEX has been lagging behind due to being situational. Stuns applied to the player will have a base 50% chance to take effect. This means that when you are Immobilized, you have a 50% chance to be unable to act. Immobility resistance will effect only the initial chance of the effect application. Once the Immobility effect is applied, Immobility resistance will not have an effect on the 50% chance. Immobility effects applied to enemies and guests will still have a base of 100% chance of taking effect. DEX will now additionally reduce the chance of Immobility effects. This is NOT the chance for a stun to apply, this is only after a stun has been applied. DEX will reduce the chance down to a minimum of 10% at 400 DEX. Enemies will also recieve this bonus, however, they will have a minimum of 60% chance at 400 DEX. These changes are not in game yet, and I would like to hear some feedback about what you think about the proposed changes! DEX loses its Glancing Blow damage reduction effect. DEX gains an effect where per every x points of DEX, a certain amount of Immobility resistance is bypassed. For example (not final numbers), if you have 200 DEX, you would be able to bypass 40 Immobility Resistance. This would stack with any other -Immobility resistance effects, the same way that STR's bonus Immobility resistance stacks. Do you prefer one proposal over the other? Neither? Parts of both? Let's hear that feedback! First off, you might notice that Book 3 Falconreach has returned to normal. Unfortunately, a small bird flew by during the casting of the ritual, interrupting it, and thus everything was reversed and all of the progress and materials were lost. Now, I know a lot of you will be hearbroken, because you won't be able to be turned into a boxcat, but worry not, perhaps one day the ritual will be completable! Anyway, on to this week's release! The next section of the Exalted Tower has opened! The Spiral of Creation, the warbeast production area, is now explorable. Fight your way through the warbeasts of the Exalted to reach your next destination! In order to access this level, you must first ascend past the first level, the Antechamber. However, if you fail in the Sprial of Creation or higher, you will have to start from the bottom again! As a result, an adjustment has been made to allow quicker progression. Mini bosses will only be fought at the end of floor3 of each level, instead of every floor. Levels have now been reduced to 3 floors each, instead of 6. 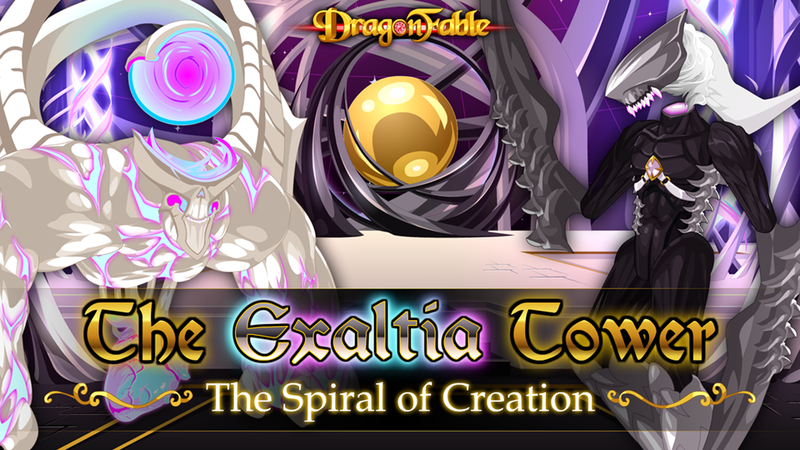 Reaching the end of the Spiral of Creation will reward you with new items! Most commonly opbtained is the Warbeast Residue, which can be used to upgrade the Apostate and Thaumaturgus weapons. However, there is also a 10% chance of obtaining a pair of Exalted wings. Four options are available, based on the wings of the Exalted in the Antechamber. These are also upgradable using Exalted Forgemetal and Exalted Biomass, although they will require much more significant investment than the weapons. These are intended as a goal for players who wish to play a lot! 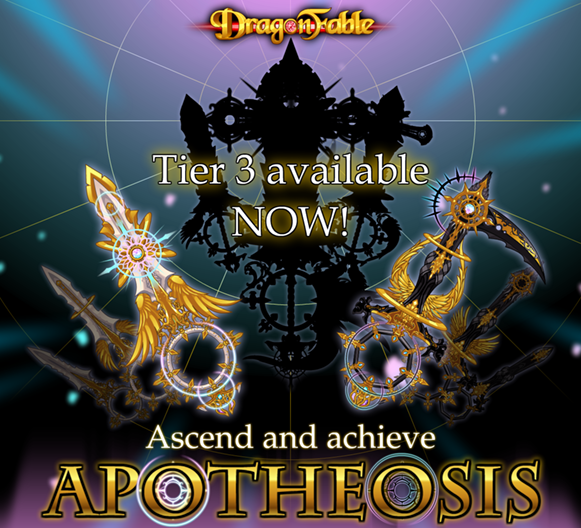 Do you have what it takes to reach the top of the Spiral of Creation, and perhaps beyond? Head over to the Challenge Board at the Inn at the Edge of Time to play! Have feedback about today's release, The Exaltia Tower in general, or the game? Having trouble with any fights? Want to discuss all things DragonFable? Welcome... to the Beginning of FelineFable! The ritual is finally complete, and the process of transforming all of the inferior denizens of Lore into clones of myself, Verlyrus the Boxcat, has begun! And there's nothing you can do to stop me! This week, the ritual targets Book 3 Falconreach Felinereach and the Serene Inn. Next... all of Lore shall be between the clawed grasp of my fuzzy paws! As the effects of the ritual spreads, soon there will be an unstoppable army of Boxcats! None will be able to stand before me! For everyone... shall be me! Want to talk about how cute Verlyrus is? Have ideas on how you can improve the box cat's quality of life? Think you have something that the cat would enjoy? Have feedback about the cat? Want to talk about all things FelineFable? Want to play FelineFable without using an internet browser? Your time in Nieboheim and the Shapeless Empire is finally coming to an end! The Magesterium has denied your request for aid, you've explored the wondrous city of Nieboheim, and you have learned so much of the rich culture of the Shapeless Empire. You explored the massive marketplace of the Forum, and even went on a heroic mission with some of Nieboheim's finest! But just as you're getting ready to head back to Captain Mazurek (and the rest of your crew, who have been waiting VERY patiently for your return! ), Nieboheim is thrust into celebration! The long awaited Harvest is here, and how could you pass up this once-in-a-lifetime event? Head over to Nieboheim's First Halo from the Book 3 Travel Map (Or sail across the Pale Sea!) to play this week's release! What could be next for the hero? What's could be next for the people of Lore? Have feedback about this week's release? Want to discuss all things DragonFable? When the Dove is away, the box cat shall play! With Dove out sick this week, it falls to me to create this week's release, which means it's time for a new Verlyrus quest (yaaay)! 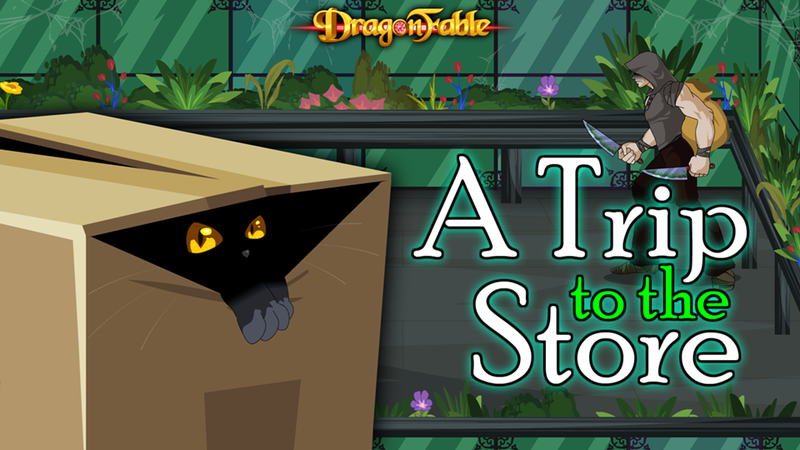 Head over to Verlyrus' house in Book 3 Amityvale to continue the fulfillment of your destiny! Which, in this case, is apparently fetching things for a cat that lives in a box. Seems legit. If you've never visited Verlyrus, or just need a reminder as to where he lives, Verlyrus can be found in the first house to the left of Book 3 Amityvale's town square, in the house with boxes out in front. I'm sure whatever I have to ask of you this time is going to be no trouble at all! On a serious note, Dove is still feeling under the weather, although doing better. We'll have more of an update soon! We have back up plans too, in case he is still doing poorly next week, so don't worry, releases are still coming! Want to talk about how cute Verlyrus is? Have ideas on how you can improve the box cat's quality of life? Think you have something that the cat would enjoy? Have feedback about the game? Want to talk about all things DragonFable? Just some Monday balance tweaks for Corrupted Doom Epoch & Epoch in general! Corrupted Doom Epoch's insane burst was a bit too risk free nad easy to set up. These changes intend to make it much more risky to use, but still keep the insane satisfaction of pulling it off. Hex and Boost momentum build reduced to 1, down from 2. Shockwave momentum build reduced to 1, down from 2. Fade duration reduced to 2, down from 3. Epoch Power overload damage boost reduced to 75, down from 100. Epoch Power Overload now stuns you for the following turn after Power Overload completes. This stun is not affected by Immobility resistance. Timeshift cooldown reverted to 24, down from 26. You can no longer use Ultra Boost or Ultra Hex on the first turn half of a Timeshift turn. This means if you Timeshift and want to use Ultra Boost of Ultra Hex, it has to be used on the free turn, rather then the first. I have a feeling that Corrupted Doom Epoch will still be a little bit too powerful after this- You can combo Defense Overload with Power Overload to avoid damage on the turn you are stunned, for example. Please keep in mind that more balance changes may come in the future as feedback is obtained! On a less optimistic note, however, Dove has fallen ill over the weekend. As a result, we will not be able to continue with our planned main story release. We want to be able to provide over 100% every week, and especially so for the main story quests. Unfortunately, with Dove ill, this is not possible. But I'm still around! So I'll be cooking up some shenanigans for you to enjoy this week instead! Thank you all for playing, and thank you all for your feedback and support! 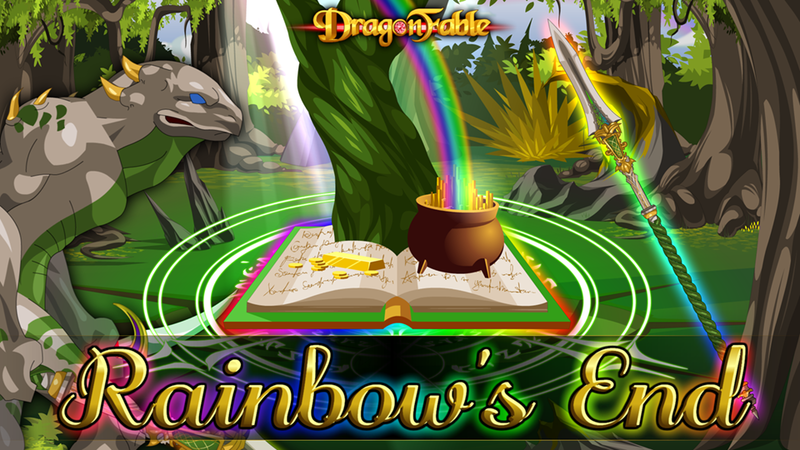 Rainbow's End is available from Chapter 10 of the Lucky Day Storybook, now available from the Book of Lore until the end of the month. Now available from the Book of Lore until the end of the month is the Rainbow's Edge cosmetic item! 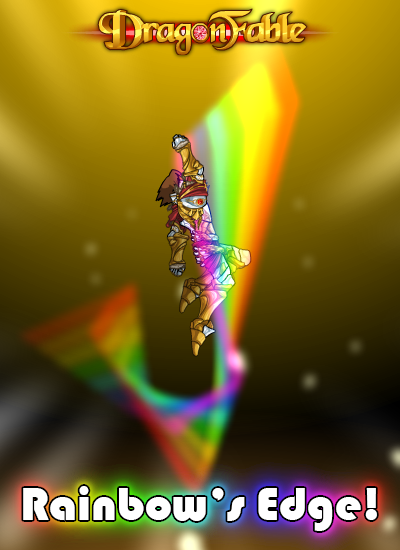 Available for 500 Dragon Coins, this weapon leaves a stunning rainbow trail when swung and moved around! Make sure to pick it up before it goes away, and let us know what you think about this kind of item in the future! 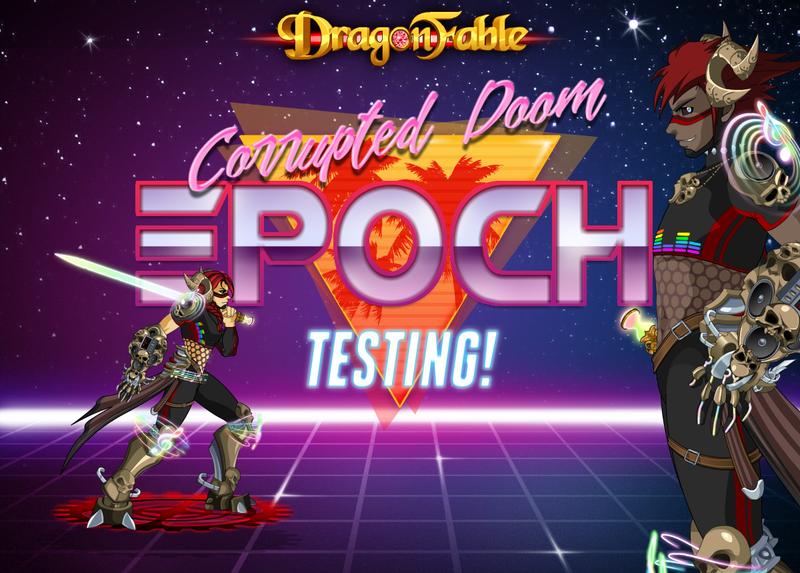 Corrupted Doom Epoch's first player test is now live! This includes a couple of balance tweaks to base Epoch as well. Starts battles with 3 momentum already stacked. Does not have access to Epoch Health Boost. Lowers healing by 33% times momentum used (up to max of 99%, up from 15% per). Cooldown increased to 19, up from 12. Duration increased to 3 turns of avoidance (up from 1). Build 2 momentum on use instead of 1. Strengthens Boosts considerably but reduces duration to 1 turn (Overloaded boosts will only affect your next turn). Strenghtens Hexes considerably, but reduces durations to 1 turn (Overloaded hexes will only affect your enemy's next attack, and your next turn). Lowers enemy All resistance by 20 per momentum used, up from 15 per. Cooldown of 18, up from 14. Potions now only build 1 momentum, down from 3. Timeshift cooldown increased to 26, up from 24. Want to get Corrupted Doom Epoch armor for yourself? You can obtain a code for the Epoch armor and the Corrupted Doom Cassette Artifact trinket when you purchase the 2019 HeroMart Calendar! Coming next week: Things in Nieboheim are coming to a head. As the Harvest closes in, it's a time for celebration and cheer... right? We'll just stay for the festivities and then head on back to Kara and everyone else to rejoin the struggle against the Rose. What's the worst that could happen? What do you think of the potential of cosmetic items? Want to discuss tha balance and skills of Corrupted Doom Epoch? Have feedback about the game? Want to talk about all things DragonFable? Some immediate tweaks to classes as a result of feedback from yesterday's release is now live! BaltSynch now has 3 options for Aegis dialogue. Soul Slice Annihilation thresholds have been reworked. If your foe's Max HP is greater than 5 times your Max HP, Soul Annihilation will activate if your foe has less than or equal to 5% of their Max HP. If your foe's Max HP is between 3 and 5 times your Max HP, Soul Annihilation will activate if your foe has less than or equal to 10% of their Max HP. If your foe's Max HP is between 2 and 3 times your Max HP, Soul Annihilation threshold is 15% enemy Max HP. If your foe's Max HP is between 1 and 2 times your Max HP, Soul Annihilation threshold is 20% enemy Max HP. If your foe's Max HP is between 1/2 and 1 times your Max HP, Soul Annihilation threshold is 50% enemy Max HP. If your foe's Max HP is less than 1/2 your Max HP, Soul Annihilation threshold is 70% enemy Max HP. These changes apply to Master Soulweaver's Soul Banish as well. Soul Vacuum now properly applies its stun. Cooldown decreased to 19, down from 29. I would also like to address concerns about other classes that may seem unbalanced. Next up to do includes a review of Eternal Epoch (as Corrupted Doom Epoch gets finished and worked on), Pirate, Guardian, and Technomancer balance passes. After that, I will likely take a look at Pyromancer. I appreciate all the feedback! Nieboheim Update and Balance Changes! A couple of new shops are now available in Nieboheim's Forum! Check out a new house shop, with new Nieboheim and Pelekoa themed houses and items available! A new barber shop with a bunch of fancy new hairstyles is also now open. Zbylut might have his peculiarities, but rest assured all hair operations are perfectly safe! 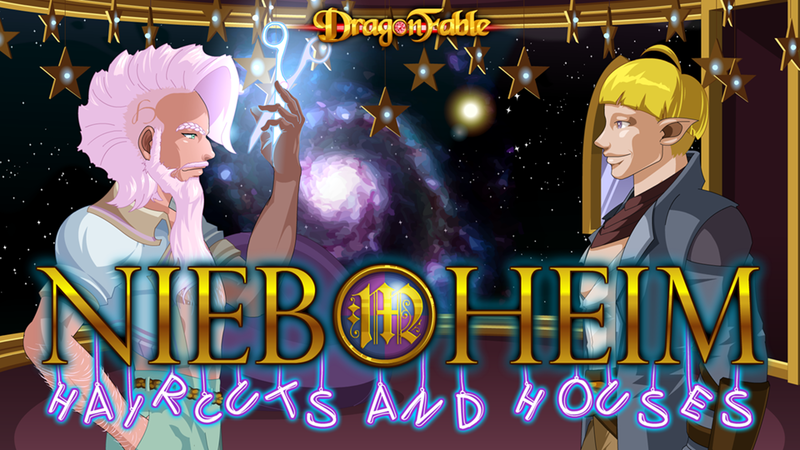 Head over to The Forum of Nieboheim to find these two new shops! And now for some balance changes! First up, Necromancer. Necro got hit a little bit too hard by its nerfs and recent balance changes. It's only recieving a couple of small buffs, but it should be something! These changes make Fear Ward more reliable and consistent, while avoiding an overpowered uptime. Applies 180 B/P/D, up from 140. Duration increased to 3 turns, up from 2 turns. Cooldown increased to 6 turns, up from 4 turns. Life Tap is now usable more often, and heals slightly more. Heals 15% Max HP total, up from 14% Max HP. Cooldown reduced to 6 turns, down from 9 turns. Next, we have some big changes to Soulweaver. It had unparalled defense, as well as a large burst and the situational ability to finish off most enemies under 15% health. These changes are intended to make Soulweaver more generalized, boosting offense while reducing some overbearing defensive options. The uptime on the Avoidance shield was insanely high. Cooldown on BaltAegis increased to 10 turns, up from 6. Cooldown on Base Aegis increased to 5 turns, up from 3. Non Baltael version total damage increased by 50%. Crit bonus increased to 200, up from 20. Basically infinite 30% damage reduction was insane. Boost effect reduced to -15, down from -30. DoT damage increased to 100% weapon damage, up from 33%. Base damage increased by 10% per hit. MP cost increased to 60, up from 40. MP cost increased to 30, up from 15. Soul Slice was a little too powerful against bosses, but not really useful otherwise. These changes bring it more in line with other "instant kill" skills. If Annihilation fails, now applies Soul Torn, a 300% DoT for one turn. Both Soul Torn and Annihilation now require you to hit your enemy to take effect. Now always tries to apply stun alongside mana burn. Stun effect reduced to 1 turn, down from 2 turns. BaltSynch previously did not require meditation to use. As a result, Baltael Soulweaver also missed out on the Calm and Inner Peace Boosts, in exchange for a massive burst. With the changes to other offensive skills, BaltSynch no longer needs to be the only burst skill. BaltSynch now requires Meditation/Inner Peace. BaltSynch damage increased by 25% per hit. Normal FullSynch damage increased by 35% per hit. Calm and Inner Peace Boost buff decreased to 20%, down from 30%. Finally, Master Soulweaver failed to stand apart from Baltael Soulweaver. These following changes attempt to differentiate Master Soulweaver somewhat, although the classes still play fairly similarly. A more powerful shield than Soulweaver's, but less uptime. Cooldown decreased to 6, down from 8. MP cost increased to 25, up from 15. As Master Soulweaver does not have Concentration, Valour Impact is now a guaranteed crit. Crit bonus on attack increased to 200, up from 50. MP cost increased to 25, up from 20. MP heal increased to 15% of Max MP, up from 10%. Now requires the attack to hit the enemy to applies effects. Damage increased by 7% base damage per hit. DoT Damage increased to 100%, up from 33%. Damage increased by 10% of base damage per hit. Now requires you to hit the enemy to apply the DoT. Threshold for Soul Banish increased to 50%, up from 15%. Always tries to apply the Boost reduction effect, along with the stun. Cooldown reduced to 1, down from 3. MP cost increased to 40, up from 25. That's all for class changes this week! Let us know what you think on the forums and on Twitter. As always, your feedback is valuable! Epoch now has new art visible when equipping the Corrupted Doom Cassette! Please note that skill changes and effects are not complete yet, and this update is only visual! SKILL CHANGES AND EFFECTS ARE COMING SOON! The left button on the Dragon Challenges board now properly loops around. Due to unforseen issues with guests and the Doom Crawler challenges, guests will be removed when fighting the Doom Crawler from the challenge board. This change is not reflected in the A.A.R.G.H. system version of the fight, however. This is a temporary measure until the source of the issue can be investigated. Fixed a few issues where confirmation boxes would have incorrect titles. Fixed ChronoZ's rewind combo not actually removing effects. Have feedback about this week's release and balance changes or the game in general? Want to discuss all things DragonFable? Some unfortunate news today. There was a bug over the weekend where Exalted Forgemetal sold for 2500 Dragon Coins a piece. This was quite clearly a mistake, and we were only made aware of this issue this morning. The exploit has been fixed as of this morning. Unfortunately, a few players (<25) abused the exploit to obtain and spend Dragon Coins. These transactions, and subsequent transactions using those Dragon Coins have been reversed. As the benefit was temporary, and relatively minor, no other action has been taken against these accounts. If you have any concerns about reversed transactions, please contact player support. Thank you for playing DragonFable, and thank you for your support! Design Note Archive - See the good, bad, and the buggly -- all the way from the start! Copyright © 2006-2019 Artix Entertainment, LLC. All Rights Reserved. "AdventureQuest", "DragonFable", "MechQuest", "ArchKnight", "BattleOn.com", "AdventureQuest Worlds", "Artix Entertainment", "Artix"